Airflex5D LLC. 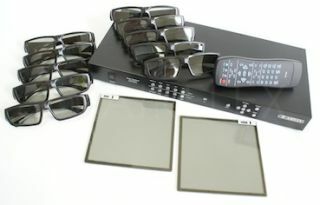 is offering a Multi-Projector Stacking System that creates a high-performance image capable of linear or circular passive 3D, in addition to enhanced brightness. According to the company, in addition to doubling up your projectors for amplified brightness, you can bring a passive 3D image into your preferred viewing space. "It is much more comfortable on the eyes to watch and the glasses are exponentially cheaper," the company said in a press release. "Until now, passive 3D was too expensive for small business and residential applications, but all of that has now changed." Airflex5D-5S is a projector stacking system that precisely aligns the images of multiple projectors vertically and horizontally into a single passive 3D (linear or circular) image. This makes producing a Passive 3D array significantly more affordable. The Airflex5D units can accommodate up to 1920 x 1200 resolution projectors with dual-channel geometric image correction while supporting de-interlacing, scaling and image enhancement. The design creates a high-performance image similar to the high-dollar 12,000 Lumen 1080P projectors with a choice of circular or linear passive 3D performance. For 3D simulation on curved and dome screens, the Airflex5D processors offer have geometric correction. Geometric image correction is essential for commercial presentations that utilize an uneven projection surface. This feature of the AF5D-5S is crucial in projecting on extreme curved or dome screen projection arrays, the company says. 1080P projectors that produce 10,000+ lumens are upwards of $50K to $80K or more. When breaking down the cost-to-performance, this is about $5-8 per lumen in picture brightness. However, with an AF5D-5S system, you can get similar results by using a combination of 4x standard 3000 lumen projectors with a pair of AF5D-5S stacking processors and get similar results while paying on average below $1 per lumen. The company says that the "AirFlex AF5D-5S is a ground-breaking design that pairs cost effectiveness with simplicity as a single-box solution to double (or 4X, 8X...etc) the Brightness in 2D, or passive 3D projected images." AirFlex5D LLC is a new U.S. based company produced and affiliated with Elite Screens Inc. The AirFlex5D-5S Series will be available through the AirFlex5D LLC EPV Custom Install Integrator Channel only with the company's two-year manufacturer’s limited warranty.